How long does a GoPro battery last? Here's the average life for Hero7, Hero6, Hero5 & Hero4. And 8 tips to extend battery life and gear for extended shooting. Plus 8 tips to make your battery last longer. You'll also see some great accessories for extended shooting. How Long Does a GoPro Battery Last? So, How Long Does a GoPro Battery Last? How long does a GoPro Hero7 Battery Last? How long does a GoPro Hero6 Battery Last? How long does a GoPro Fusion Battery Last? How long does a GoPro Hero5 Battery Last? How long does a GoPro Hero4 Battery Last? What Will You Use to Extend GoPro Battery Life? One of the biggest complaints about GoPro is battery life. As soon as you start looking into getting one, you hear about battery drain and start to wonder how long does a GoPro battery last. The answer seems simple but there are a few things to consider. So let's get to it. Too many features enabled: The more features you have turned on (WiFi, GPS, voice control …) the faster your battery will drain. Cold temperature: It will drain faster if the weather or the water is cold. Age: And the battery life gets shorter with age. How long a GoPro battery will last depends on a number of factors. According to GoPro, here is the approximate battery life for every GoPro Hero model released since September 2014. The battery in the Hero7 Black is removable. This means that you can bring extra batteries and charge your dead batteries while you're shooting with fresh ones. The battery in both the Silver and While are built in. This seriously limits shooting time on each adventure. As you might expect, shooting at high resolution, high frame rates will consume your energy faster. Here's an overview of how the resolution affects battery life in the Hero7 Black. As you'll see below, the battery life has not improved since the Hero6. It actually has gotten worse. Best Battery for GoPro Hero7 Black: I'm a long time fan of WasabiPower. They match the same storage capacity of the original GoPro battery (1220mAh) but cost much less. These batteries often ship with a charger. It's worth having a charger – it will also charge the GoPro battery that came with your camera. The shooting time depends on the video resolution you are shooting. Here are a few examples of what to expect. Best Battery for GoPro Hero6 Black: I've been using WasabiPower batteries for many years and they haven't failed me once. These come rated at 1220mAh with an approximate run time of 2 hours. Of course, this depends on what resolution you're shooting – and how many features you have on. The battery life of the GoPro Fusion actually isn't that bad, especially considering the resolution that it captures. This time varies, depending on the video mode you've chosen, but not that much. What's the best battery for GoPro Fusion? If you're off on a shoot with your Fusion, you'll need some extra batteries. These Enegon batteries come well reviewed and include a dual charger. These batteries are rated at 2620mAh and the charger allows you to charge two at once, including your original battery. You can shoot with your fresh battery, while your dead batteries charge in your backpack with a power bank. The Hero5 Session has a built-in battery and can't be swapped out. This means that you're limited to 95 minutes of shooting time before you have to plug the whole camera in to charge. What's the best battery for GoPro Hero5 Black? Fortunately, the Hero5 Black comes with removable batteries. It will come as no surprise to you that I love WasabiPower batteries. These batteries match the GoPro specs but cost much, much less. At this price, it's worth picking up a charger and at least a couple of batteries. It is easy to burn through 2 or 3 in a day. What's the best battery for GoPro Hero4? While the availability of these isn't like it was, there are still some great options for batteries to fit a Hero4 Black or Silver. From our experience, these times are very generous. With our Hero4 Black, we average about 1 hour of continuous shooting. That's not very long, is it? But don't worry, you can make it last longer. So the important question may not be, how long does a GoPro battery last. But, how can I make my GoPro battery last longer? If you only turn your camera on when you want to shoot, or you use one button control, you'll may get the better part of a day out of your battery. That's what I do (on an average day of shooting). If that sounds like what you're planning, here are some tips. Don't use the extra settings (WiFi, GPS, voice control). Keep your batteries warm in cold weather. Consider putting them in an inside zippered pocket of your jacket. Don't use a remote or smartphone app. Use a wall charger (faster and better charge than USB cable from your PC). The voice control setting drains the battery even when you think the camera is off. So before you power off make sure the voice control is disabled. You might also consider taking the battery out when the camera is not in use. That way, if you've forgotten to disable anything, your battery will still be fully charged when you want to use it. Trust me, it's pretty frustrating when you want to start shooting and your battery is D-E-A-D, dead! Especially when you fully charged it the night before so you'd be “all ready to go.” I just charge it the night before and then pop it in before I set out to start shooting. With that being said, it's not much fun if you can't use all those cool settings on your GoPro. So now we'll look at how to extend your GoPro shooting time. If you want to shoot underwater, do extended time-lapses or video recording, you'll need some accessories to give you more juice. With the following GoPro accessories, you'll have the juice to shot all day long and change your batteries less. And when you aren't worried about battery drain, you can be more focused on the action around you. If you want to keep your GoPro going all day you'll need more than one battery. Charge up a few extra batteries the night before. When one drains, just pop in a new one. It's easier if you can charge a couple at a time. Here's a great charger that can help with that. The same battery works in Hero7 Black, Hero6 Black and Hero5 Black. But, remember that you can't use Hero4 batteries in Hero5 cameras (or newer) and vise-versa. Some aftermarket batteries come with a larger storage capacity than the original GoPro batteries and cost much less. Be careful if you have a Hero5! GoPro added an update with it's latest firmware v.01.55 (as of Nov 26, 2016) which does not allow the use of Wasabi or any other aftermarket battery. GoPro Hero4 Cameras can use a battery backpack. The backpack will extend your battery life, usually by double. GoPro Hero5 cameras (and newer) cannot use the battery backpack because they do not have the same connection on the back. 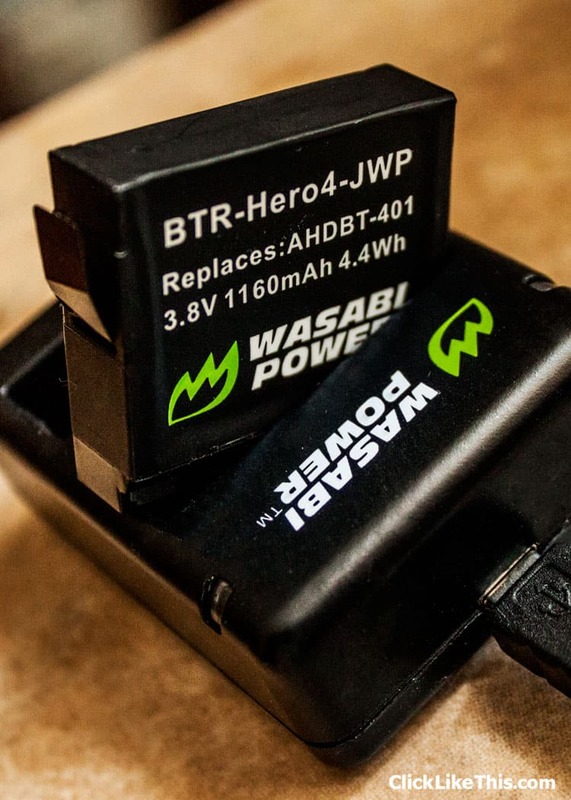 Here is a video of a Wasabi battery backpack and how it attaches to the camera. A mobile power bank is one of the best ways to keep your GoPro going through extended shooting. Even with the more basic models, you can more than 10x your battery life. This charger by RAVPower has 16750 mAh – compared to the standard 1220 mAh that comes with the camera – provides almost 14x the power. In the following video, you'll learn how to use a GoPro Hero5 Black (and Hero4) with a mobile power bank. As you'll see in the video, you'll need to remove the side door to be able to plug the USBC cable in while the camera is mounted. This means that your GoPro is no longer waterproof. It's very similar with the Hero5 Session as you'll see in the following video. As you can see, you can use a power bank for all your GoPro cameras as long as you have the right cable. This Vidpro grip/charger also works great as an external power source. It'll help extend your shooting time up to 5 or 6 hrs. You will need to buy an extra cable to use it with Hero5 Black. In the following video you'll see the grip and how it works. Remember, you'll need to take that side door off your Hero5 Black before you can use this mount. Another great accessory to have is a solar charger, especially if you like to camp or go on long hiking trips. You can plug your GoPro directly into it, or use its mobile battery pack. I've done both with it, and it works great. I've found the 14W model to be more than enough for charging my phone and camera batteries. In this video, you'll see a review of the SunJack Portable Solar Charger. Check out our review of the SunJack Solar Charger. And read more about unique GoPro mounts. Did you see any accessories that you'll be getting to help your GoPro batteries last longer? I usually carry extra batteries, and we use the SunJack Solar Charger for shooting time-lapses. But, I've got my eye on that VIDPRO Grip/Charger for my Hero5 Black. What do you use to make your GoPro batteries last longer? Please share with us by commenting on this post. If you're wondering if you should get a GoPro read this before you buy. Good stuff…been searching for a way to extend my go pro 5 batteries as I use them to shoot tennis matches which can go from 2 and a half to 3 hours long. Thanks very much for the tips on the vidpro grip. I ordered one and will put it through it’s paces. This is nothing to do with extending battery discharge time, nor battery life itself, and all to do with noobs who haven’t learned how USB charging works IN GENERAL. This is why it’s so easy to accidentally-buy under-specified USB chargers that, for example, share 2.4A between TWO USB charging sockets, as if that’s anything but 50%-deficient in output for modern use. Devices that charge slower cannot be harmed by higher-output chargers, whilst time can be wasted by waiting (let’s ignore the charging-faster puts more strain on the battery as that’s a subjective, device-specific charge-circuit design issue). Having the option to charge as fast as the fastest technology in the charging-chain is important. After that, one is free to calculate something else, rather than compensate for silly time-wasting, confusing abuses of what should be a consumer STANDARD (‘USB’). Hi, on the Go Pro Support page I looked up why my record time seems short. I have a Hero4 with the Bacpac attached. This according to your video should go about 2 hours, l’m lucky to get 1 1/2 hours. On the Go Pro website under support it says “Make sure that Wi-Fi and Protune (if applicable) are turned off and that you don’t have any BacPac accessories attached to the camera.”. What is the point of having the Bacpac? I do not have Wifi on and don’t know what Protune is. Thanks for any info. I keep coming back to Go Pro,I would like on but,,,, Extra batteries,Cables,Fittings (this means more money),these wont fit this model, it wont be waterproof if you do this, etc,etc. Go pro need to simplify everything AND extend the battery life, until then, I cannot justify buying into this flawed camera model. I am driving around Australia to raise funds for the drought stricken farmers, Melbourne to Adelaide, then to Darwin, then across to Brisbane, down to Sydney then return to Melbourne. I am sponsored by GoPro with a Hero 5 camera and want to try to document as much of it as possible, the main problem I have is the fact I am 82 years old and perminantly disabled and driving my own HiLux ute with 300,000 on it, I am hoping that channel 9 will run it on TV later, but I am not the most tech person to be doing this, it will be a challenge, and a severe threat to my well being, but whats life without a challenge.